"Alternate 9 Point White Star Lamp"
This paper star lamp is from India. It measures 26" across. 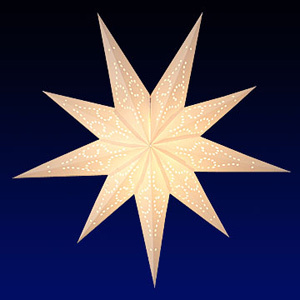 This star lamp is a white paper star with 9 alternating points (5 big points and 4 smaller points). It looks very classy and sophisticated. This star will look great at a wedding or other event. It's very unique and fun. The color is pure white. You can change the bulb color inside to give it a different look for different occasions.